Ultrasonic cleaning is a precision process which uses cavitation bubbles induced by high frequency pressure (sound) waves to agitate a liquid. Click here for a link to the process. 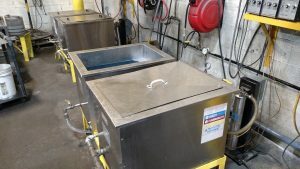 KVF Quad Corporation, the Midwest’s premier ultrasonic cleaning operations, offers not only the ability to clean parts in house, but also we are able to build to suit custom Ultrasonic system solutions. Used widely in the automotive and aerospace industries, this process will help clean parts of many shapes and sizes. If you think this process is right for you, please give us a call at 309-755-1101 or email sales@kvfquad.com for a free quote today!